AV Klaus-Jörg.Müller, Frankfurt am Main, Germany, included this beautiful mosaic floor in the Russian Chapel, a NF 28 design. The stones are from the new factory's mosaic set. 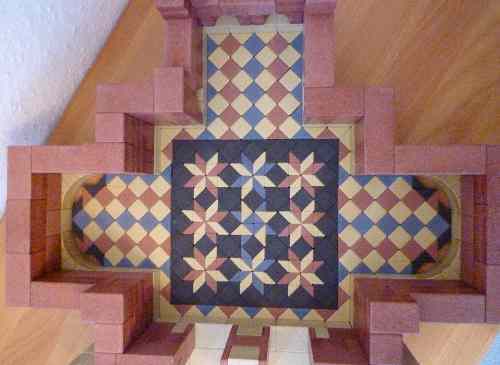 Mosaic floors add interest to all Anchor buildings, particularly churches, because the interior of churches is more realistic than other Anchor buildings. There are more pictures on the builder's page. Next Treffen (gathering) of Anchor friends at the new factory in Rudolstadt: Saturday, September 18, 2010. Next CVA meeting: Saturday, October 23, 2010; Hotel Lapershoek in Hilversum, Netherlands. The final NF supplement set, 32B, was here, but it is out-of-stock. More are on order; I expect delivery in July. For those of you who are interested, here is a picture of me and my cats. Yes, I have "new" cats. My picture is relatively new, taken in October, 2008, on a trip to Antwerpen. For the month of July, 2010.